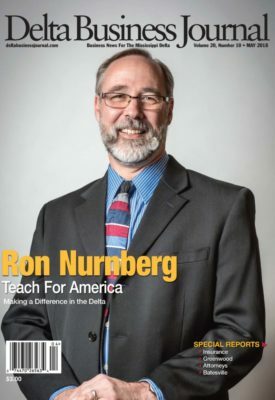 Ron Nurnberg is deputy executive director for Teach For America (Mississippi), a non-profit organization that’s mission statement is to enlist, develop, and mobilize as many of our nation’s most promising future leaders as possible to grow and strengthen the movement for educational equity and excellence. And as of June 1, 2018, the area that Nurnberg oversees, Teach For America, Mississippi, will become known as Greater Delta instead. Before his TFA and Oxford, Miss. days where he now lives, home for Nurnberg was a small town in south central Iowa called Arispe, which during a good year can boast about 85 people. “Including cats and dogs,” he laughs. Getting from that tiny spot in Iowa to where he lives and works today in Oxford was a bit of a circuitous route. Nurnberg was the youngest of four children. He spent his freshman and junior year of college in Pella, Iowa, at a private university, while going to university for his sophomore and senior year at Trinity College in Wales. Nurnbery realized he could take classes in the medium of English or Welsh, so he took all of his courses in English. His friends there were first language Welsh, and he says he spent a lot of time in the pub then. Nurnberg finished college with a business and communications degree and thought he would go into banking in Chicago. But his newfound love of Wales took him on a different route. In December 1980, Nurnberg went to work for his St. Louis friends and helped to grow Dressel’s Pub in the West End into a thriving business. “It became a place where you could come for a good meal, an honest drink and interesting conversation,” he says. It was while he was working at the pub in St. Louis he met his partner, Joe Osgood. When they got tired of the St. Louis winters they’d head south to Alabama to visit friends and relatives as well as in Vicksburg. One time while visiting Dr. Lucien and Lois Ferris in Vicksburg, Nurnberg discovered a book Lucien’s nephew, William Ferris, had co-written about southern culture. At that time, William Ferris, ran the program for Southern Studies at Ole Miss. Immediately, Nurnberg was fascinated and knew he wanted to go through the Southern Studies program. A few years later, Oxford began calling and he applied and was accepted into the Southern Studies program at Ole Miss. In 1993 he enrolled in the program. Because of his connection to Vicksburg, he was sent there to do some work. He persuaded the then mayor of the Vicksburg and aldermen to put up $1.25 million to purchase a historic complex downtown and turn it into a cultural center. The purchase took place and Nurnberg launched the search for the first executive director of the center. “And that’s still going on today and so is the pub in St. Louis I helped start in 1980,” he says. In May 1996, Nurnberg was offered a position at Teach for America. “They were looking for someone who believed in the educational potential of the Delta in Arkansas and Mississippi, and I did,” he says. Today, he is deputy executive director where he oversees the development of the innovative and operational side of the entity’s work. Currently, Arkansas has 63 first and second year teachers and Mississippi has 131 first and second year teachers.